Barnsdales has been appointed as managing agent for a £65 million development which brings together high quality student, residential and commercial accommodation. The company has agreed a three-year deal to look after key aspects of the management of New Era Square – located between London Road and Bramall Lane and dubbed Sheffield’s Times Square and the city’s Chinatown. The work will be managed from Barnsdales’ Sheffield office and responsibilities will include service charge management, facilities management and rent collection. The first block within New Era Square opened in September to provide 100 studio apartments as student accommodation. The KH Oriental Supermarket is due to open in the coming weeks and another block comprising more student accommodation, a common room and additional retail units is on schedule for completion by Christmas. 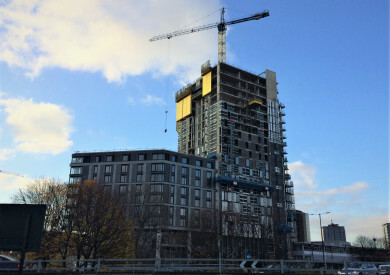 The opening of a 20-storey tower block by the end of May 2018 will mark completion of phase one of the development and will bring more student accommodation, a café and private apartments. Phase two, due for completion by mid-2019, will see the addition of further residential and retail units, a medical centre and an office block for the China-UK Business Incubator. In managing New Era Square, Barnsdales will draw on the management skills of its residential and commercial property departments with additional support from Barnsdales FM. Rob Johnson, Associate within Barnsdales’ Commercial Property Management and Professional Services team and based in the firm’s Sheffield office, said: “This is a landmark development which is of great significance regionally and nationally and we are delighted to be involved. “We were introduced to the team at New Era Development by our industry contacts and we won a three-year contract against some very strong competition. The scale, variety and profile of the project are such that it calls for the highest standards. That will be an ongoing challenge, but one which New Era Development recognises we are capable of meeting. Jerry Cheung, Managing Director of New Era Development (UK) Ltd, said: “New Era Square has been 10 years in the making and we are extremely proud of the quality of all aspects of the development. The intention from the outset was to provide residents with everything they need whilst living and studying in Sheffield.